Manipulators have been used in forges for many years and have proved an effective way of feeding furnaces, mills, hammers and presses. Operations in forges tend to be more restricted and require better planning and flexibility to provide complete integration. 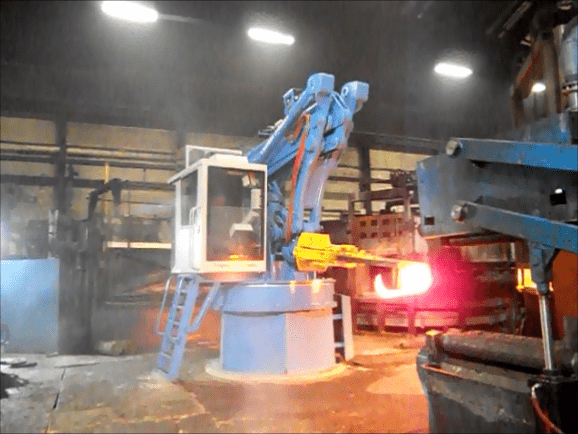 Because of the high value parts being handled in forges, break down and stoppages are costly, reliability is key to the design. 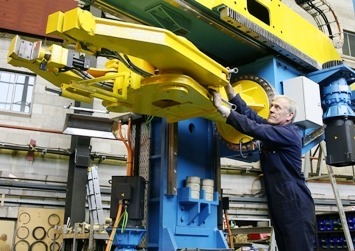 Clansman Manipulators are the result of many years experience and operate in most of the worlds leading forges! As with the foundry manipulators every piece of the machine from the main control card (where there are no relays) to the main vertical boom (where a steel casting is used to avoid fatigue cracks in welds) to the rotating hydraulic joint in the wrist (which allows all hoses to be kept inside the wrist structure) has been analysed and reanalysed so that we obtain a long life. Long life means 10 years on 3 shifts a day with a cycle every 6 seconds – that is a ferocious duty of 40,000,000 cycles, requiring very precisely calculated stress levels. When Clansman build a robot it is designed and built in close cooperation with the customer. It selected for the specific duty taking into account the frequency of operation the loading and the stresses. It is never good to work a machine at the top level of its stress envelope, therefore all Clansman machines work well within that envelope.